Créé par Nuexzz, il s’agit d’un frontend pour Super Model Emulator permettant plusieurs customisations (à l’instar de Sega Model 2 UI). Added – button of the roms directories. – Has been added to the frontend the possibility that the same check the file games.xml.De this way whenever they add, modify or remove roms to the file, the frontend automatically to be able to read the file will update the list of roms to use . – If the UI does not find the nvram folder, it will create the folder itself so that certain configurations of the ROMs that we use are saved correctly. – If the UI does not find the saves folder, it will also create the above automatically. – Fixed a bug with the snapshots since if any of them were missing then the images did not come out correctly. – The custom resolution option has been added allowing us to choose the output resolution without being prefixed in the UI. – Added a new icon thanks to Hipnosis (collaborator of insertmorecoins.es) that has lent its help so that the UI has a new modernized icon. 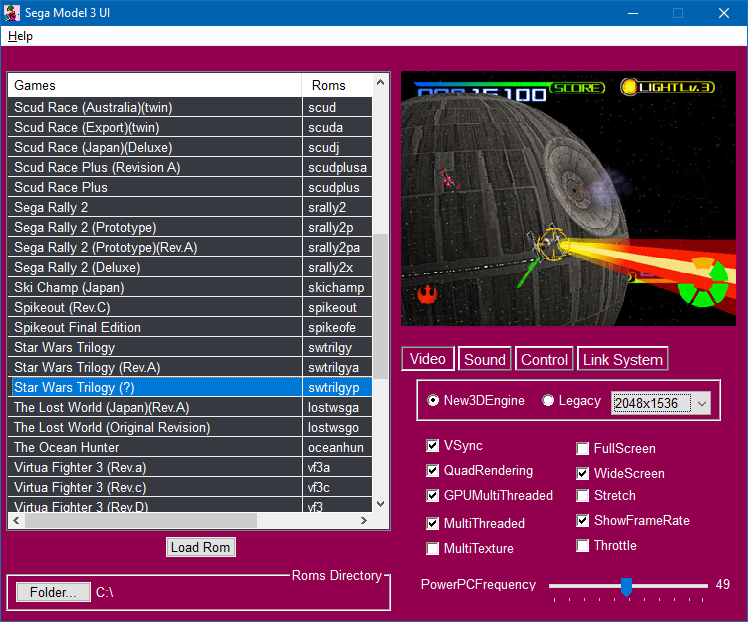 – Added dialogue box has been added informing us of the loading of the games. – Added the option to hide the window by command line when loading games leaving a cleaner load in the eyes of users.